His approach explores everything from one’s current job to what to eat; from being thankful to simply just remembering to breathe. All the while he stills champions each individual as unique, with a path and purpose like none other. Remember when Michael Pollan, author of “The Omnivore’s Dilemma,” “Food Rules,” and “In Defense of Food,” first stunned the nutritional world with his uber-minimalist approach to healthy eating (“Eat food. Not too much. Mostly plants.”)? Wachob’s take on holistic, self-tailored, and mindfulness-based health is easily as groundbreaking. Instead of the typical, narrowly defined, healthy messaging we usually hear (low-fat-this, cardio-that, food journals, mini-meals, target heart rates, you get the picture), Wachob espouses a new message of wholeness, uniqueness, balance and acceptance that culminates in a diverse and broadly applicable approach to wellness for every body. That said, it’s worth mentioning that as I began reading his book, it became quite evident that he and I differ substantially in our world view. For example, he is a 6-foot, 7-inch, New York fraternity-brother basketball star turned mega-start-up-blogger with a background in Wall Street. I’m a 5-foot-2 librarian with a public health twist from Oregon who doesn’t know her NYSE from her S&P (yes, I had to look it up to get it right) and once lived happily on a communal llama farm. 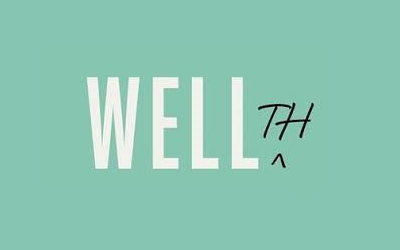 The message here is that although "Wellth" is an anecdotal account of one man’s foray into health and wellness, his story hits a universal nerve that not only explodes the accepted concept of health, but also redefines our American paradigm of success. Taking the expectation of monetary gain as the measure of achievement and replacing it with measures of gratitude, laughter and purpose is as meaningful as Pollan’s plea to reacquaint mainstream society with real, whole food as a basis of daily eating. This summer at LPL, we’re pushing the boundaries of health and wellth by celebrating the theme of Summer Reading: “Exercise Your Mind.” We’re kicking off with Library Olympics, full of crafting, gaming and jubilation. We’re hobbiting trails to Rivendell by tracking miles walked, biked, or jogged. We’re gathering together to move our bodies in new and fun ways (yoga, functional fitness, tai chi, and more!) on the library lawn for Fitness Fridays. We’re hiking through history with legendary Kansas wanderer, Henry Fortunato. We’re launching a collection found nowhere else on earth (how very Lawrence!) to bring access to fitness resources to our city with the GYM Pass collection. We’ve got storywalks, Guinness world records, teen iron chef, local foods and urban agriculture, canoeing adventures, and so much more! Not to mention the honor of being host site to both the Lawrence Summer Food Program and Tuesday’s Farmer’s Market. May your summer be long, wellth read, and wellth lived. Cheers! — Gwen Geiger Wolfe is an Information Services and Public Health Librarian at Lawrence Public Library.